The Barcelo Marbella is a recently opened hotel surrounded by lush tropical gardens in the exclusive beach town of Guadalmina. The San Pedro de Alcántara beaches are less than one kilometre walk away and Marbella is an eight kilometre drive from the hotel. Guests can enjoy a round on the 45-hole Guadalmina Golf Course before relaxing in a Turkish bath at the fitness and spa centre. The hotel provides golf lovers with club storage, caddy master and golf cart parking facilities. Outdoor swimming pools for adults and children, an indoor swimming pool, sauna and a number of massage and beauty treatments are also on offer. Guests have a choice between dining at the buffet restaurant, enjoying more formal dining at the à la carte restaurant, or a snack by the pool. 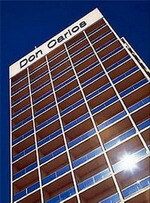 The Don Carlos Leisure Resort and Spa hotel is located near Marbella, Spain, and has its own beach club. The hotel is by the Mediterranean Sea on the Costa del Sol's 'Golf Mile', seven kilometres from Marbella, and 14 kilometres from Puerto Banus harbour. Surrounded by subtropical gardens leading to Nikki Beach's golden sands, the Don Carlos Leisure Resort and Spa hotel occupies a high-rise tower with far-reaching hill views. Five onsite restaurants and bars with sea, garden or pool views include Los Naranjos, serving European dishes with a twist. Breakfast buffets are provided in the marble-floored Bahia restaurant. Light meals are on the menu at the Gaudi-inspired poolside Sol y Sombra restaurant. 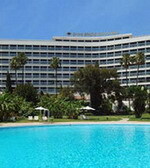 The Gran Melia Don Pepe is a large, modern resort situated on one of the Costa del Sol's famous beaches. It is surrounded by tropical gardens, and is just 800 metres from the centre of Marbella. The hotel offers several dining and drinking options; at La Farola guests can choose lunch and dinner from an à la carte menu, while listening to live piano music; and at Dama de Noche guests can enjoy Mediterranean cuisine on a terrace overlooking the tropical gardens. El Copo is a poolside snack bar with beach-style decoration, and La Palapa serves a buffet lunch and overlooks the pool and Marbella's promenade. Guests can also take advantage of the beach on the hotel's doorstep, and take a dip in the outdoor swimming pool, while children can play in their own pool. The hotel is situated in a privileged location just one kilometre from the beaches, bars, designer boutiques and restaurants of Puerto Banus which although only a short walk or shorter taxi ride away is far enough for you to relax in peace. World famous chef Jean-Christophe Novelli (awarded no less than four consecutive Michelin Stars and 5 AA Rosette Awards,) has opened a stylish new restaurant in the hotel offering the coast’s only Chef’s Table where up to 10 guests are able to directly observe the chef de cuisine prepare their food. A separate private dining facility is also available. Relax on the Ipsa timber decked terrace, which surrounds both deck level pools; whilst soft music and the cascade of the waterfall creates the perfect ambience in which to relax and unwind. 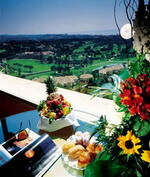 The hotel resides in the midst of Golf Valley with over 50 courses within a short drive. Green fees, car rental and golf tuition are all available to the hotel guests. Set amidst subtropical gardens and waterfalls, Hotel Puente Romano is modeled on a traditional Andalusian village. 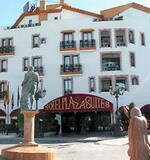 The hotel is located on Marbella's Golden Mile, three kilometres from Puerto Banus. There is a choice of dining venues, from Café El Puente with its Roman bridge setting, to fine Italian dining in Ristorante Roberto's and lunch buffets at the Beach Club. Guests can spend the day relaxing by one of the three swimming pools, visit the shopping arcade with its hairdressing salon and boutiques, or unwind in the Turkish baths after a game on one of the ten tennis courts. Decorated in warm terracottas and cool blues, the 274 guestrooms have an elegant colonial feel, with marble floors, Persian rugs, heavy furnishings and rich, coordinating upholstery and fabrics. Set on top of a hill beside the Rio Real golf course, and offering spectacular views along the coast, the Incosol Hotel Medical Spa is an upmarket spa hotel situated 800 metres from the nearest beach and 4.5 kilometres from Marbella's town centre. The hotel hydrotherapy circuit, free to all guests, has a circuit of six varied swimming pools, including an indoor giant club-shaped spa tub overlooking the Japanese-themed garden, indoor heated pool, outdoor lap pool, infinity lake pool with waterfalls and a centrepiece palm tree island and in-pool hydro massage bench. Other facilities include a steam bath, sauna, Kneip shower, snow room, jetted shower, indoor heated pool and heated thermal beds. Internationally known Puerto Banus yacht marina lies at the entrance to this moderately priced apartment hotel located a five-minute walk from a white, sandy Mediterranean beach. Four miles away is the Costa del Sol's cosmopolitan Marbella. Occupying three blocks and adorned with sub-tropical gardens, the white-stone hotel includes an outdoor swimming pool, two squash courts, a lighted tennis court, and a lighted paddle tennis court. A coffee shop and a bar are available. 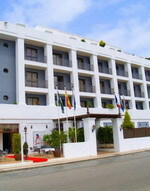 Surrounded by Puerto Banus' 100 restaurants, bodegas, and boutiques, the hotel is within one mile of the Playa Levante beach and the mile-long, white marble promenade. This hotel, occupying three blocks with sub-tropical gardens, has 319 large, apartment-style units with combined living and sleeping rooms. 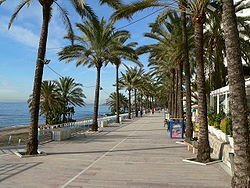 The Vime Reserva Club de Marbella is situated 10 kilometres from Marbella town centre and one kilometre from the beach. The modern white-painted building has numerous archways and balconies and is surrounded by leafy gardens. Guests can enjoy a drink at the poolside bar before sampling the international buffet at Reserva's Restaurant. There are two outdoor swimming pools, one for adults and one for children, as well as a solarium for committed sunbathers. One further swimming pool, along with a fully-equipped gym, lies inside, in the hotel's fitness centre. Away from the hotel, those keen on a boat trip can visit the Puerto Banus Pleasure Harbour, 19 kilometres away. Malaga Airport is a 45-minute drive and 48 kilometres away.